Dave was born and raised in the Pacific NW where the natural beauty has a major influence on his style and form. Attending Portland State University Dave studied with James Lee Hanson who introduced him to the bronze foundry. Working with clay, making molds and then pouring bronze led to a new understanding of achieving form. While researching the master sculptors Don Wilson became an instructor at PSU and introduced Dave to stone carving. 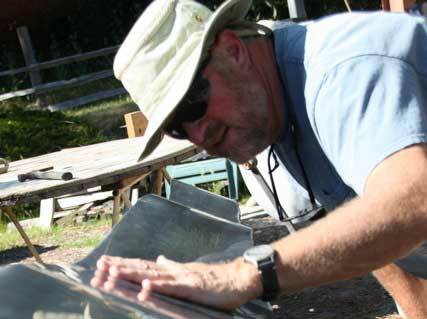 Dave has been carving mantel to monumental sculpture ever since. Some stones measure fourteen feet high and weigh 6,500 pounds. The “Vertebra” series relates to bone and it’s marvelous structural arrangement representing an interlocking system of strength and beauty. Dinosaur and whale bones are the major influence for this series. Researching the Egyptian and Inca cultures and tapping into their rich source of information has fueled my imagination to carve the hard stones. I have traveled to Carnac France, Stonehenge England, Machu Picchu Peru, East Africa and visited the monasteries in Lhasa Tibet to explore and research many of the standing stones left by my predecessors.